… a contemporary novel about domestic violence against men. Interview about Men Cry Alone on American talk radio Butterfly Dreams Abuse Recovery (starts about 4 mins 40 secs into programme). Alfred, Tom and Gordon are strangers, yet they share a terrible secret … they are being abused by their wives. Men Cry Alone follows three very different stories of three very different men who are being physically and emotionally abused by their wives. The book shines a light on to a subject that is still considered by many to be taboo. ‘Early in 2011 I suddenly found myself with a great deal of spare time. I started to think about an idea I had in the late 1970s for a drama concerning domestic abuse where the victim was a man. I’ve no idea where this came from as it was an era when you simply didn’t read or hear anything about such matters. ‘Back to 2011 and I began drafting the outline of a novel, the main characters being three male and one female. I wanted to raise the profile of another taboo subject and examine a relationship where someone was being abused because their partner has dementia. Researching for the book was one of the most extraordinary experiences of my life. Men Cry Alone (2012) was published by FeedARead Publishing and is available in paperback (£9.99) – ISBN: 978-1-78176-838-9 – from any high street bookshop, while the paperback/ebook can be ordered from Amazon . ‘I wept many times reading Men Cry Alone. It is a profoundly moving novel … a compulsive read, with a forensic examination of the lives of three men abused by their wives.’ Erin Pizzey. In 1971 Erin Pizzey opened the world’s first shelter for battered women. ‘A sensitive and touching portrayal of the far-reaching effects that dementia can have within a marriage and one that many carers will recognise. No one should have to cope with dementia on their own as Men Cry Alone makes abundantly clear.’ Alzheimer Scotland. ‘The experiences of these fictitious characters echo the real life tragedies that I have dealt with for nearly thirty years. Reading these stories, written with such sensitive narrative, made the occasional tear fall. Raising awareness of the domestic abuse faced by many men and women may give them the hope that they need not cry alone.’ Susan Brown, Chaplain to the Queen in Scotland and Minister of Dornoch Cathedral. 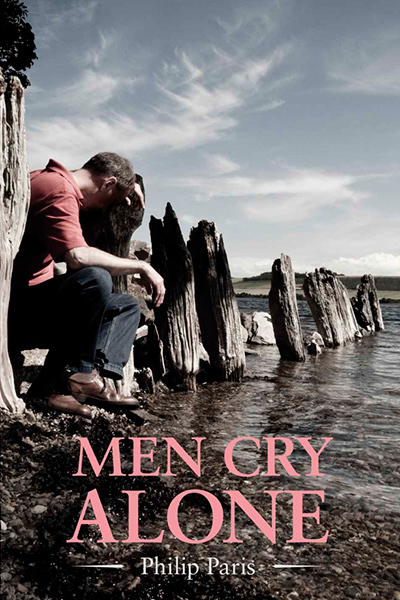 ‘Men Cry Alone brings to life with great clarity and vividness the ordeal suffered by many men behind closed doors.’ Mark Brooks, Chairman of the UK charity ManKind Initiative.